Drupal 8 Beta 1 has a lot of nice templates to use which can be brought into a custom theme and then customized. I brought in core's menu.html.twig into my custom theme and indeed I can customize markup in there. 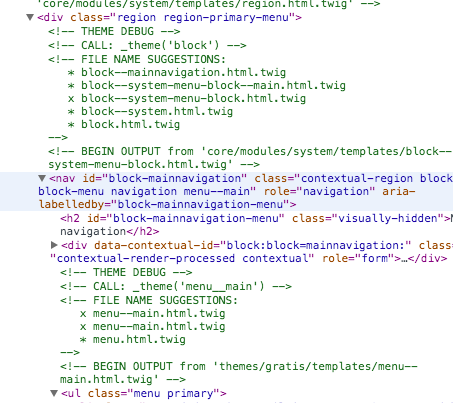 However, this template overrides all Drupal menus, not just the primary menu which is the one I want to override. I tried the Devel module for Drupal 8 figuring I might get some insight about what's going on under the hood. However, the module still looks like it's in a state of flux and I got massive errors. My goto module for template suggestions for Drupal 7 is Devel Themer (Theme Developer) but alas no Drupal 8 version. I also tried getting specific with the template name and tried menu--primary.html.twig but that did not work either. ... but no joy there either. so I am out of ideas on how to do this. Answering my own question here, this will probably be useful for those looking to debug twig. Now you get a nice tree of variables that prints out similar to what you would get if you did an old style kpr(get_defined_vars()); in Drupal 7. I see from the debug printout that the name of the menu is simply main. Customize as a themer to your hearts content. Throughout this process, don't forget to clear cache and change / remove any debug code when you are done. In addition to this, with debugging active, Chrome prints out possible template suggestions a la devel_themer so you don't necessarily have to use Kint. Just in case the OP meant the primary menu and not the main menu, we need to remember regions can have any menu assigned to them, or even multiple menus. * Implements hook_theme_suggestions_HOOK_alter() for block templates. * Implements template_preprocess_block() for the primary menu region. * Implements template_preprocess_block() for the sidebar_first region. Why is my Menu Router being rebuilt on every request? How to scrape specific elements of the Drupal theme to a file?